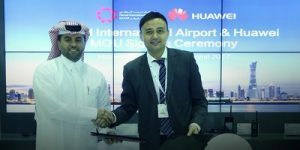 At the 17th Dubai Airport Show, in Dubai, UAE, Huawei and Hamad International Airport(HIA) signed a Memorandum of Understanding (MoU), formalizing a strategic partnership to enable the airport’s digital transformation. The MoU provides a broad framework for collaboration between HIA and Huawei for co-creation of innovative concepts, prototypes and solutions using cutting-edge technologies, particularly in the areas of IoT and autonomous machines, to address real business challenges and opportunities. The objective is to accelerate digital transformation at Hamad International Airport and to share the solutions with the community for wider benefit of the air transport industry. Through this cooperation, HIA aims to improve the passenger experience, enhance security and communication, and increase operational efficiency. Hamad International Airport, located in Doha, Qatar, recently joined the exclusive ranks of global airports awarded the prestigious ‘5-Star Airport’ designation by Skytrax, the London-based aviation institute and the gold standard for conveying the passenger’s voice in airport and airline rankings. This makes HIA the first airport in the Middle East to earn this acclaimed title and the 6th airport globally to be rewarded that accreditation. Also, Hamad International Airport won the “West Asia-Best Airport” award for two consecutive years 2015 and 2016 by “Future Travel Experience Awards – Asia“. Huawei has provided a wide range of ICT solutions for airports, airlines, and air traffic control authorities across the world, enabling them to achieve digital transformation and improve their service capabilities, operational efficiency, and revenue growth. These ICT solutions include indoor/outdoor modular data centers, servers and storage devices, converged cloud platforms, Big Data analytics platforms, and integrated wired/wireless communications solutions. By the end of 2016, Huawei provided ICT products, solutions, and services for more than 40 airports, airlines, and air traffic control authorities worldwide. That includes more than 15 global airports with more than 30 million annual passengers. Dubai Airport Show 2017 is held from May 15-17 at Dubai World Trade Centre (DWTC). Attendees can visit Huawei’s booth at Stand 4140. For more information about the exhibition of Huawei’s products and solutions at the fair, please visit http://e.huawei.com/topic/aviation2017/index.html.